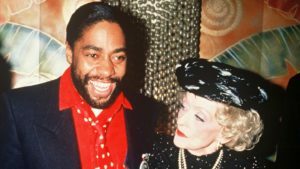 Even into her late 70s, Bette Davis continued to inspire artists and designers, including Patrick Kelly. In MISS D & ME: LIFE WITH THE INVINCIBLE BETTE DAVIS, which I co-authored with Kathryn Sermak, we describe the Hollywood legend’s last decade and her brave struggle to continue to work and live with style and dignity. This charming story of her affinity for the young designer didn’t make it into the book, but it made a great article for The Daily Beast. In it Kathryn and I describe the serendipitous moment when the septuagenarian became Kelly’s muse as well as how these two kindred spirits died within a few months of each other. Buy the book! You won’t be disappointed by this intimate portrait of Miss D!